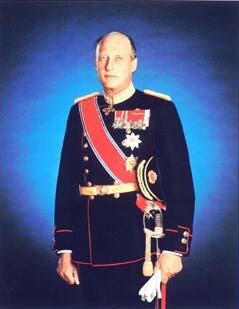 King Harald ascended the throne on the death of his father, King Olav V, on 17 Januar 1991. Like his father and his grandfather, King Haakon VII, he adopted the motto "All for Norway". The birth of a prince is always an historic event. However, it was a particularly special occasion for the Norwegian people when an heir to the throne came into the world on 21 February 1937. The prince was born at Skaugum, the estate that is still the home of the Royal Family. This was the first time in 567 years that a prince had been born in Norway, and the birth ensured the line of succession of the relatively newly established Norwegian Royal Family. King Haakon VII became King of Norway after the dissolution of the union with Sweden in 1905. According to the Constitution of 1814, he could only be succeeded by male heirs (this provision has subsequently been amended). With the prince's birth, the country was guaranteed a king, at least for the next two generations, and this meant a great deal to most Norwegians. King Harald is the son of King Olav V (1903-1991) and Crown Princess Martha (1901-1954). King Olav was son of King Haakon VII (1872-1957) and Queen Maud (1869-1938). King Haakon was Prince Carl of Denmark before he was elected King of Norway in 1905. Queen Maud was the daughter of the Prince of Wales, later to become King Edward VII, and Queen Alexandra of Britain. King Harald's mother was the daughter of the Swedish Prince Carl (1861-1951) and Princess Ingeborg (1878-1958). Prince Harald was raised to carry out the duties to which he was born. On the one hand he was prepared for a life as custodian of royal traditions. On the other, he grew up with strong personal ties to the people and to his own time, in keeping with the traditions of modern constitutional monarchies. King Olav's announcement in 1968 that Crown Prince Harald wished to marry a commoner triggered a heated political debate on the future of the monarchy. The Crown Prince had known his bride-to-be for nine years before it was decided that they were to marry. King Olav himself made the decision after having consulted the Government, the President of the Storting and the leaders of the various parliamentary groups in the Storting. The response was favourable. The vast majority of the population accepted Sonja Haraldsen immediately with great enthusiasm, which indicates the status enjoyed by the Royal Family and by Sonja Haraldsen as an individual. She became inseparably linked with the national unity symbolized by the Norwegian Royal Family. The marriage took place in August 1968. The couple's first child, Martha Louise, was born on 22 September 1971, and the second, Prince Haakon, on 20 July 1973. Queen Sonja was born on 4 July 1937, and grew up in Oslo. After completing lower secondary school, she took a diploma in dressmaking and tailoring at the Oslo Vocational School and a diploma in dress making at the Ecole Professionelle des Jeunes Filles in Lausanne, Switzerland. She subsequently completed her upper secondary education and received a Bachelor of Arts degree in English, French and art history from the University of Oslo. The Queen has been particularly involved in humanitarian work, and she served as Vice President of the Norwegian Red Cross for a number of years. She is also known to have a keen interest in art and culture. The deep commitment shown by King Olav and the then Crown Prince and Crown Princess is one of the reasons the monarchy has such a strong position in Norway today. Another reason is the significance of the Royal Family as a symbol of social stability and political continuity in politically turbulent times. And above all, the Royal Family is a symbol of unity, which proved extremely important during the Second World War. The first three years of Prince Harald's life at Skaugum were peaceful ones. But this peace was destroyed in the early hours of 9 April 1940, when Hitler's troops invaded Norway. The Royal Family was one of their primary targets. Forced to flee in great haste, King Haakon, the Crown Prince and Crown Princess and the Government left the capital by train only hours before the occupation forces arrived. The King and the government held out against the Germans until Norway capitulated in June. They then flied to London, where they set up a government-in -exile . The Crown Prince and the Crown Princess parted company at Hamar. Crown Princess Märtha and the children crossed the border into Sweden under cover of darkness on 10 April. Several months later they went to the USA. The Crown Princess, Prince Harald and his two elder sisters, Ragnhild and Astrid, lived just outside Washington D.C. until the liberation in 1945. On 13 May 1945, Crown Prince Olav returned to Norway, where he was joined by the rest of his family and King Haakon on 7 June. They were greeted by jubilant crowds. After the liberation Prince Harald attended Smestad Primary School, a Norwegian state school. Apart from the police guard in the corridor, his schooling was no different from that of other children. The prince took part in a wide variety of sports. As a ten-year-old, he laid the foundation for an active career as a regatta sailor. He had his own boat, which he sailed to victory during the summer regattas in the Oslo Fjord. After completing primary school, Prince Harald continued his studies at Oslo Katedralskole. He took his upper secondary diploma in science in 1955, and matriculated at the University of Oslo that same autumn. Immediately afterwards, he began his military education. First he attended the Cavalry Officers' Candidate School at Trandum, and then the Military Academy, from which he graduated in 1959. Today he is a general in the Army and the Air Force and an admiral in the Navy. Two years before he graduated as a non commissioned lieutenant, Prince Harald was made Crown Prince and attended his first meeting of the Council of State. His grandfather, King Haakon VII, died on 21 September 1957, and Harald took his place beside his father in the Council of State just a few days later. As Crown Prince, Harald was the King's deputy. The first time he served as Regent was in 1958. From the time King Olav fell ill in the spring of 1990 and during his convalescence, the Crown Prince Regent presided over the Council of State and assumed some of King Olav's other duties. After completing his compulsory military service as an officer, Crown Prince Harald went to Oxford. He studied political science, history and economics at Balliol College, the same college his father had attended more than 30 years earlier. In 1960 Crown Prince Harald made his first major official journey abroad. He visited the USA in connection with the fiftieth anniversary of the American Scandinavian Foundation. The Crown Prince proved to be a good ambassador for Norwegian interests, particularly Norwegian shipping interests. Crown Prince Harald took his place at his father's side in the years that followed. The two men complemented each other in carrying out the extensive official duties required of the Royal Family. The Crown Prince opened exhibitions, took part in conferences, visited homes for the elderly, and made official visits abroad. He opened new airline routes and Norwegian tourist offices abroad, and carried the Norwegian flag at the opening of the Olympic Games in Tokyo. After their marriage in 1968, Crown Princess Sonja took over her share of the official duties, both in Norway and abroad. Together and separately, the Crown Prince and the Crown Princess visited most of Norway and made a great many journeys abroad, including visits to Australia, Thailand, Malaysia, India, China, Tanzania, Latin America and the USA as well as to most of the countries of Europe. Crown Prince Harald also did what he could to promote Norwegian business interests abroad, but only insofar as this did not interfere with his domestic duties. On 21 January 1991, King Harald took his oath of allegiance to the Constitution. Queen Sonja accompanied him at this historic event which took place in the national assembly- the Storting. It had been 69 years since a queen had last entered the national assembly. Queen Sonja was present again in 1993 during the ceremonial opening of the Storting. At his own wish, King Harald was consecrated on 23 June 1991 in the Nidaros Cathedral in Trondheim. Later in the year, the royal couple went on a ten-day post consecration tour in the southern half of Norway. The following year, they completed the tour with a 22-day trip to the country's four northern counties. As King and Queen, Harald and Sonja have carried out numerous representation duties at home and abroad. King Harald and Queen Sonja are both involved in various forms of outdoor recreation and are nature lovers. They have also played an active role in the preparations for the 1994 Winter Olympic Games in Lillehammer. Whereas Crown Princess Sonja took part in the planning of cultural activities, Crown Prince Harald was honorary chairman of the Lillehammer Olympic Organizing Committee and a member of the LOOC's general assembly. He also took part in several of the Committee's board meetings. The King as well as the Queen were eager spectators during several of the Olympic events. His Majesty has made a name for himself in a number of national and international sailing competitions. As Crown Prince, he represented Norway several times in the Olympic Games, won the Gold Cup Races in 1968, and took first place in the Kiel Week Races in 1972. He was number two in the World championship in the half-ton class in 1982. In the summer of 1987, he won the world championship with his new yacht, the one-ton "Fram X", which was a gift from the Norwegian business community on his fiftieth birthday. The following year the yacht and its crew won a bronze medal in the world championship in San Francisco. At present, the Royal Family resides at King Harald's childhood home, Skaugum, in Asker, just outside Oslo. However, they intend to move to the Royal Palce at a later date. Skaugum, which was a wedding gift from King Olav, covers a total of 325 acres and is run as a farm with livestock and cultivated fields. Please contact webmaster@reisenett.no if you have any comments or questions about our pages.